In part 1 I raved about the joys of the Harefield. Their visual aesthetic compromises are tiny compared to their audible aesthetic strengths. Their abilities as low-distortion, phase-accurate nearfield monitors are better suited to exploiting the full information-potential of domestic audio sources than most high-end passive loudspeaker systems driven by killer amplifiers. This review assumes you have already read the Harefield review first, and merely describes the differences in performance between the little Hailey reviewed here, and the Harefield I so enjoyed previously. Bill Dyer's Digital Audio Systems range (DAS) currently comprises 3 models plus a subwoofer. There is an even smaller powered-cube for purely pro use, but the smallest active 2-way model are the Hailey (w350xh230xd280mm, my measurements note 10mm less depth than the manufacturer's spec). The logo representing a microphone symbol with the 'D' of DAS through to the speaker drive-unit symbol shaped 'S' still seems very appropriate. The Hailey are designed for use where space is at a premium, in a very small room, above a mixing-console or as side or rear speakers in an Ambisonics set-up. They are not designed for other multi-channel formats, and Ambisonics has more connection with real-stereo than THX, 5.1, 7.1, SQ, CD4, QS, UD4 or any other flash-in-the-pan home-entertainment format. The Hailey might well serve those with tiny listening rooms where big-boxes are impossible and big-bass unsupportable, either by room-length or neighbours, and where wall proximity becomes mandatory. In these smaller Hailey models there are the same two 50W power-amplifiers in each speaker, and the same drivers as the larger Harefield model reviewed last time. This only leaves 10 litres of fresh air behind the bass driver, lined with 40mm of acoustic foam to reduce internal reflections and standing waves. For the chunky ultra-long-throw 18cm bass unit this small volume may cause big problems, either of extension or power-handling, or both. If the driver attempts to compress or release the air load faster than air's fluidity allows, the air will baulk and its rate of compression will define the movement of the cone, rather than the voice-coil-magnet system that should control cone-movement. Furthermore, the smaller ports, dictated by the smaller cabinet frontal area, will flow less air before the airspeed in the ports accelerates towards the magnitude of the speed of sound, above Mach=0.05 audible distortions may arise due to the non-linearity of the airflow at these velocities. Thus, the design rule-of-thumb is often that the flow rate must not exceed a tenth of Mach 1, or Mach=0.1. The speed of sound in air varies from around 330ms-1 to 345ms-1 depending on altitude, atmospheric pressure and humidity. Reflex-port airspeeds higher than Mach=0.05 may result in chuffing noises from the ports, which is why port tube ends are often flared, as these noises are clearly audible above the music being played. As the port airspeed increases further, to represent even bigger fractions of Mach 1, a thwack can be heard from some systems, as the air in the port compresses against the air-pressure at that instant in the cabinet volume. Long before audible distress is heard from ports, the bass alignment has ceased to behave as the designer intended, causing bass compression. The rectangular Harefield port has an area of 37.5^2cm, the two circular Hailey ports have a combined area of just 14^2cm, less than half the Harefield. If ports are too small, the air velocity through them is too great to pass unimpeded, even when measures like flared ends are taken. As SPL (sound pressure level) increases, initially the box no longer behaves in the designed alignment, the port air mass movement no-longer being defined by the springiness of the box enclosed air-volume, but restricted by the maximum flow-rate. The DAS Hailey attempts to overcome these problems by using two short flared ports to reach the desired area and tuning. Bill notes that he has chosen a bass alignment for accuracy rather than to extend the low end beyond its capabilities, setting a high 55Hz box-tuning in the little 10 litre Hailey. There is no EQ bass adjustment in the crossover, which would be an easy cheat but would have power-handling and group-delay problems. Tweeking alignments electronically can damage phase integrity. Response thus extends down to 55Hz (-3dB) in comparison with Harefield's 40 Hz. Hailey's 55 Hz box tuning for the fs=39Hz driver will restrict cone movement at a higher frequency than the classic B4 alignment. This may ameliorate the inevitable power-handling limitations of the smaller cabinet and port area. Both Harefield and Hailey models achieve flat frequency responses despite Bill eschewing this parameter, saying, "Distortion, Transient response, Phase response, & Settling time are sacrificed [in conventional loudspeakers] on the altar of a flat amplitude response". The measured distortion remains similar to the Harefields at 70Hz at 90dB, suggesting that the chosen bass-alignment is a good compromise. The sacrifice could be the weight of lowest few notes of the E string of the bass guitar or double bass, or especially the low B of a 5-string bass. The ferro-fluid cooled fabric-dome tweeter is mounted directly on the baffle, with a baffle hole cut out to make space for the magnet. The internal cabinet pressure may act directly on the rear of the tweeter and the Hailey relies on the seal of the tweeter flange to prevent leakage. In the smaller model this could be more of a problem because of the greater pressures potentially generated inside, than the Harefield's identical driver in a bigger box when both attempt to reproduce the same sound pressure and frequency. During the test there was a problem with air leaking past the tweeter flange causing chuffing noises and a simultaneous loss of bass. Easily fixed by retightening the tweeter screws, this could be permanently avoided by sticking a blanking plate over the rear of the tweeter cutout. To have to retighten driver screws should be out-of-character for a domestic product at this price-point. No doubt, the babies fit the Origin Live open frame tripods perfectly and they suit the performance better than my alternative heavy sand-filled multi-pillar monsters. Bass is faster and vocals clearer on the lighter stands. Positioning is totally uncritical. The improved dispersion offered by the narrower cabinet, combined with phase-accurate crossovers makes it possible to walk across in front of one of the Haileys and not hear the usual dramatic fluctuations of spectral balance. These are even more uncritical of position than the bigger Harefields. The bevelled edges of the front baffles no doubt help even further the advantages gained by the reduced width. Bevelled edges reduce diffraction compared with sharp corners and better still than furniture mouldings around cabinet edges. Edge diffraction effects cause colouration by affecting different frequencies by different amounts. Bevelled baffles also reduce the first reflection effect and step response, that boost of all frequencies below that of half wavelength equal to baffle width happens more gently with curved and bevelled edges. Their lighter bass enables them to sit happily just 50cm from the rear wall. Wall proximity provokes the inevitable soundstage collapse caused by early reflections, but overall, the spectral balance survives this boundary proximity. Toe-in is surprisingly uncritical. As long as they roughly point towards the listener they are OK. Best is tweeters firing directly at my ears, as I relax on my replica Le Corbusier chair. Once again, the Haileys, like the Harefields, were affected by choice of support. They also benefitted from better support than the proprietary instrument feet supplied. The cabinets are not deep enough to reach the rear spikes of the Origin Live stands, so they got a mix of 2 Mitchell Tendercups on spikes in line with the front edge and a Mitchell Tenderfoot at the rear. This gave a lift to the sound compared to the Polychrystal footers that were the preference of the Harefields. The supplied feet were not good by comparison. Detail is superb. The familiar distortions of passive crossovers are missing. The colourations of passive systems may sometimes seem to add sparkle, but it's just that: added sparkle, like sugar frosting, rots yer teeth. Speaking of bass, the accuracy of the bigger Harefield is present in the smaller Hailey, even though the weight is slightly reduced. Bass is fast, but lightweight compared to the Harefield. As the sound levels increase and the frequencies reduce, the smaller cabinet volume makes its presence heard. The twin ports begin to chuff long before the speaker runs out of steam in other respects. Being circular plastic ports, this chuffing is really obvious. This is the price you pay for that reduced footprint. Before the chuffing intrudes, the bass becomes squashed as SPL rises. The maximum SPL before audible distress is well below the Harefield. My big room does not suit these babies at all. They struggle to fill it with any large scale works. String quartets succeed where dance music fails. 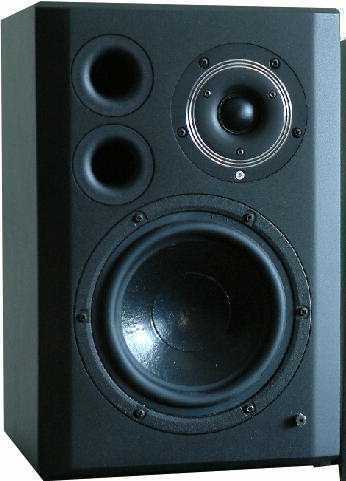 Compared to passive speakers, that is nearly all speakers on the domestic market, the bass is better articulated, more accurate (so instruments retain their timbral qualities to their lowest registers), times better (so there's more desire to dance and more likelihood of staying in step when you do dance), and retains that percussive body when the bass-drum pedal meets the skin. Piano retains that percussive quality so often lacking in hifi reproduction. Drums portray stick noise where it belongs: at the beginning of the note. The snare thwacks of Lou Reed's Andy's Chest, on Transformer, are the best I've heard them, when the Haileys are fed my my Decca London mounted on the Hadcock GH242SE. This is the best sound I've ever heard from a speaker & power amplifier combination occupying so small a volume, but I've been spoiled by the Harefields in my system at the same time. Bigger is definitely better to my ears. The smaller Hailey boxes do have a slight dispersion advantage but the accurate crossover alignment (more possible because of the active filters) minimises this advantage in my larger listening room. In smaller rooms the smaller baffle width should have advantages in maintaining an accurate frequency balance from early reflections. Early reflections in small rooms have a dramatic effect on power-response in the whole room which may have a massive effect on overall frequency balance, despite similar anechoic 1m response curves. The DAS Hailey and DAS Harefield are accurately specified monitors whose dispersion character has been carefully chosen among the myriad parameter juggling compromises. The smaller model has less dispersion advantage over its larger sibling than might be expected. The Harefield had managed a clean 97dB at the listening seat in my spacious 5.5m x5.5m x3m (averaged dimensions) room. The bass driver diameter was the limiting factor for the Harefields' prodigious maximum bass output, but the ports and cabinet volume restrict the Hailey to much lower sound pressure levels with bass-rich tunes. In my big room, the Hailey went no louder than I can achieve with big passive-crossover loudspeakers, before they distorted beyond acceptability. No amplifier & passive loudspeaker this small will get close to the Hailey performance, but the Harefield is so much better. The Hailey costs £4000 (5950€ January 07) per pair. The Harefields sell for £5000 (7450€ January 07), just 25% more. In value-for-money terms there is no comparison. The Harefield is much more than 25% better than the Hailey. One role I could understand for the Hailey is where there is a significant space and location restriction, perhaps where a subwoofer is handling the lowest octave. One of Bill's intentions for the Hailey is for Ambisonics set-ups where they would be sharing duties with front Harefield, or in the restricted space of a studio control room. There may be a Hertford subwoofer in the pipeline, featuring the 280mm Scanspeak revelator subwoofer. Now that really would be worth hearing. Once a pair of speakers is properly mounted on good stands, there is much less apparent size difference between them, the stand height carries most of the visual impact, so in a reasonably sized room I would strongly recommend the Harefield. If I wasn't surrounded by my own loudspeaker projects I would buy a pair of Harefields myself. 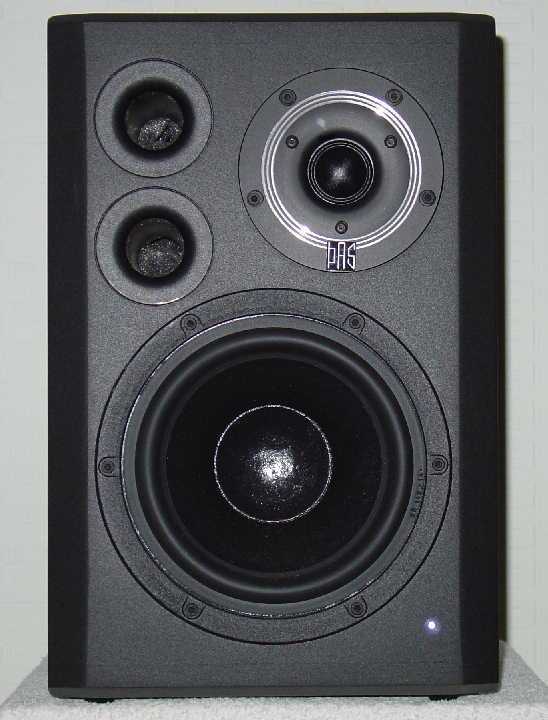 The last time I bought a new pair of readymade speakers I was 14, the DAS are that good. In bang-for buck terms nothing passive that I've ever heard (amplifier plus speaker) comes close. If you have to stand your speakers within 1m of the wall in a small room, the Hailey would be the most musical sound I can imagine in such a confined space. If you have never heard good accurate nearfield monitors, you owe it to yourself to seek out a pair of DAS Harefields at a show or a home demonstration. Bill Dyer does plan to extend the range to include more domestically desirable finishes, because it would be good to know that more people are hearing accurate sound from their home audio than is currently the case. Bill has built a prototype woofer cabinet, which doubles as a stand in the manner of the Wilson Puppy, to complement the DAS Hailey. 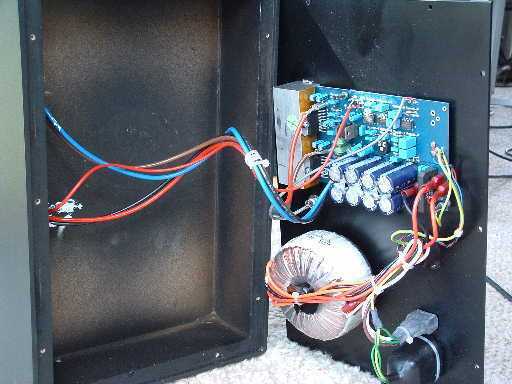 This will have its own high volume displacement bass driver, active crossover and amplifier. Thus the Hailey will be freed from trying to perform in the lowest 2 octaves, where it struggles in all but the smallest rooms. The Hailey plus woofer combination could be a real winner if it lives up to the promise shown by the other models. It would be the only active combination to rival the current Watt+Puppy combination, or even the classic BBC LS3/5a+AB1 (aka Auntie's Bottom) combination. There may also be a new version of the little Hailey, featuring a unique construction designed to make the most of the restricted footprint. This may be what is needed to define a role for the Hailey in its own right, rather than being the Harefield's little sibling; watch this space! Neil Young: Greatest Hits cd, why remastered?